This time last year Dave and I were preparing to return to Ethiopia. The goal of the trip was just to be with the people; it was the first time back since my cancer diagnosis, and we needed to see each other. But that didn't mean ministry stopped. One of the big projects we were arranging was Bible teaching for the rural churches in Burji. One of the challenges of the church in Ethiopia is biblical teaching at the local church level. Following the system established by the missionaries 70 years ago, promising young men are currently removed from their villages, transported far from home into a different cultural setting for 3-4 years, and then returned to their home village setting for a teaching ministry. Unfortunately, this system is both unbiblical and ineffective. It is unbiblical because the Scriptures never encourage biblical training in a sterile, lifeless environment like a classroom. All the way through the Old and New Testaments, the passing of spiritual knowledge occurs within the context of relationships. The home relationships and the local church relationships are paramount, parent-to-child and brother/sister-to-brother/sister respectively. In our western world we have organized training into something artificial, centered on courses, and issuing forth into a piece of paper that declares our qualification for ministry. We regularly ignore the fact that neither Jesus nor the apostle Paul modeled this artificial system of training. As my husband has often said, the extraction system of education is expensive, produces an elitist mentality, and creates cultural issues of conflict. Men who are removed from their home villages and transported to large cities far away almost never return home to do the ministry for which they were ostensibly prepared. As a result, the men, women, and children in distant rural villages are left on a spiritual starvation diet. Perhaps they can read their Scriptures, if they have them, but there are no concordances, no libraries, no teachers to help them understand the deeper things of God. The rural people need to be taught the Scriptures so that they can stand in the midst of difficulties, resist false teaching, and grow mature in the faith. How can their need for teaching be met? Thankfully God has placed us at a point in history where technology allows ministries to interface. We have today the ability to do so many things that were unheard of just a few years ago! And the work of creating biblical teaching in the rural churches of Burji has been facilitated by three technical ministries in particular. As many of you know, we have been establishing solar-powered lights and loudspeakers in the rural churches of Burji, in the far southwestern region of Ethiopia. With these systems, we can use teaching on CDs for the church folk and evangelism. But each system costs about $3,000, making it too expensive to place in each village. 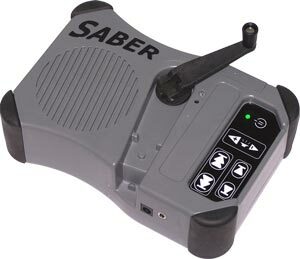 Global Recordings, however, has created small hand-held players called Sabers. Each Saber is about 5" x 8" x 2". It has an internal battery that can be powered by electric recharge, by solar recharge, or by hand winding. It has an internal memory that is permanent. And it has SD slots that provide umpteen hours of additional teaching or music. The Spirit of God directed me to this technology, and in the providence of God, I was listening to Thru the Bible (TTB) teaching on the Bible Broadcasting Network. Thru-the-Bible teaching was done by Dr. V. Vernon McGee almost 50 years ago; I grew up listening to it on the radio, and Dr. McGee was a personal friend of my grandmother's. It is solid teaching that starts in Genesis 1:1 and goes passage by passage through the entire Bible. Now this teaching has been translated into many, many languages. Imagine my delight when one day they read a letter from someone in Ethiopia who was listening to the Thru-the-Bible teaching on radio! This teaching had been translated in the Amharic language! I got on the phone to TTB and was delighted to find them willing to work with me. Do you know how many ministries will not work with other ministries? It is a constant challenge to find open hearts and open hands in the Gospel work. By the grace of God two phone calls led me to the denominational media office in Ethiopia that sponsored the translation and audio recording of TTB in Amharic. Imagine my joy to learn that the department head of this work was from Burji himself, having come to the Lord decades earlier when a missionary played the Gospel story in his language on an old phonograph record! I asked them, "Would you be willing to copy all the TTB/Amharic lessons onto CDs for me, so we can play them on the loudspeakers?" Their answer: "Yes!" "What is the cost for this?" I asked. "Only the cost of the labor and materials," they answered. Amazing! They were not wanting to make a buck off of a fellow Christian! Praise God for His grace to us through these brothers in the Gospel. Then I showed them the Saber. "Would you be willing to also make a copy of the lessons onto SD card for me?" I asked. Their answer: "What is an SD card? We never heard of that!" To make a long story short, I introduced them to the technology of SD cards, taking with me hundreds of SDs as well as the SD/computer adapter. So in March, we left the capital city with the promise of about 75 CDs and about 40 SDs, full of good Bible teaching, going all the way through the Scriptures. Back in the U.S., a young man in a rural church in Texas taught me how to do recordings on my laptop, so that the Burji church leaders could make recordings in their tribal languages and the clinic staff could make recordings on diseases and sanitation! Then I located on the internet a ministry called Faith Comes by Hearing that provided the audio New Testament in both the Amharic and Oromo languages of Ethiopia. So I ordered 15 Saber players and began to download the Amharic NT onto some (for the Burji and Konso peoples), and the Oromo NT onto others (for the Guji people). These downloads were put on the permanent internal memory of the Sabers. At our last trip, in July 2010, I met with Oshe Burje. He is a church leader in Burji who works with all the rural churches in the Burji, Guji, and Konso areas. I taught him how to use the Saber players with the SD cards and internal memory, how to use the laptop recorder to make more SD and CD programs, and how to use the CD players for the loudspeakers. We put together a notebook for each of the rural churches and a tracking system. Then I returned to the USA and he went to work. So what has been the result of all this work? In the 6 months since we introduced this Rural Church Bible Teaching, two church leaders were chosen from 14 rural churches, and two church leaders were chosen at each of the 5 loudspeaker-churches. These men came together for training by Oshe. And were sent home with a plan for gathering the churches to listen. Oshe teaching the Saber program to rural church leaders. Praying with hearts of thanksgiving for the Saber teaching. 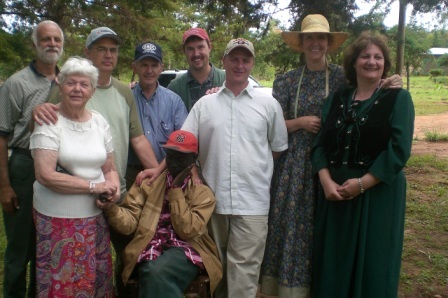 Photo of rural church leaders. What is happening in the distant rural churches? I'm dying to tell you! By God's grace, whole churches are gathering several times in a week to listen! And not only are they listening inside the church buildings. They pull out the Sabers and start the lessons at any location where people are gathered. So over the marketplace, along the roadsides, while watching their herds in the fields...anywhere people are, you will find the Sabers playing! And where the word of God goes, the Spirit goes. And He quietly does His work in the hearts of the people, believers and unbelievers alike. Let me tell you two recent stories. First, the story of Shoko. He is a blind young man in his early 20s. He is the only believer in his family. He lost his sight suddenly due to a detached retina. He will never be able to see again in his life. But while he is blind physically, he has very clear sight spiritually! Hungry for the Word, we got him the audio NT on cassette tape; in the past 3 years he has memorized (yes, memorized!) most of the New Testament! I have heard him recite with my own ears, starting in Matthew 1:1, going through Romans. His goal is to memorize the entire NT so that he can recall it instantly, starting anywhere, because he wants to preach the Word to others too. In June, 2009, Shoko came to me. "Please, Mama B, help me to understand the teaching of the Scriptures!" We told him, "Be patient. Teaching is coming." So of the 15 Sabers we gave to the Burji churches, one belongs exclusively to Shoko. And he is devouring the teaching! Not only himself, but he gathers anyone and everyone in his village to listen with him. Several times in a week he gathers his little "flocks" for teaching, and what a joy it is to him to be able to have a serious ministry, despite his blindness. Praise God for technology! Praise Him for generous co-laborers from other ministries! Praise Him for the heart that desires to know His word! Second, the story of Wordaya Village. In Burji the population is largely Muslim, with some Christians and some animists. The Muslims have declared certain villages to be their own, and they resent any Christian activity in these villages. In one of these villages a few months ago, young Muslim men attacked the church during an all-night prayer meeting; they were trying to destroy the solar panel we had installed there, but they were unsuccessful. In the providence of God, the government came to the village and announced to all the people that federal law protects people of all religions. In the end, the older Muslim leaders apologized to the church! Wordaya is one of these villages that the Muslims have declared to be their own. In 2007 we were trying to show the Jesus Film in this village when a group of young Muslims began a riot. The government police were called, the rioters were imprisoned, and a policeman escorted us from village to village for the rest of our visit. When the Sabers were played in Wordaya, people gathered to listen. In the crowd was a family whose son had been sick for 7 years. His parents had taken him to witchdoctors, to Muslim healers, to hospitals. Now they were financially broke, and their son was still sick. "Does Jesus heal?" the father asked the man playing the Saber. "Yes, He heals" was the answer. The church people then went to the home of the sick son, prayed over him, and immediately he was completely healed! Do you think that family remained in the Muslim faith? No way! They had seen the personal love and power of the Lord Jesus. They had heard His teaching. And they gave their hearts and souls to the Lord of the Universe, Jesus Christ. And not only they, but also another family moved over to embrace Jesus as Lord. This sent ripples of discontent amongst the devout Muslims in the village. The persecution began immediately on these two families. For example, the people will not allow the cattle of these families to graze with them on community land. Shunning, mocking, exclusion is usually only the first step of pressure brought upon those who leave Islam. Will you pray for these two families, and for others in this village who are considering the claim of Jesus to be the only way to God? The persecution is not only for those who convert. The Church continues to suffer difficulty because of the teaching. This is not new. Jesus said that anyone who stands for Him and His Kingdom will suffer. Make no bones about it! To belong to Jesus means to suffer. But we suffer with joy, knowing that He is worthy of any pain we have to endure. Oshe, who has been coordinating the Saber program, suffered such persecution just last week. Inexplicably, all 5 of his oxen were killed by a vehicle owned and driven by a Muslim. The "accident" happened in broad daylight. The explanation given was very sketchy. How can a vehicle kill 5 large oxen at one time? It seems impossible to be an accident. As I write this, the police are still investigating, but in the meantime, the Lord's people here have overflowed with love and support for Oshe. Monetary gifts, letters, emails of encouragement, and prayers have abounded to help him. This is the planting time in Ethiopia. All across the country the farmers are out in their fields plowing. If they miss this season of planting, their whole crop is lost. Without waiting for justice in the Burji court system, the Body of Christ rallied to the aid of Oshe, and already his oxen have been replaced. The Family of God spans all national boundaries, all languages, and all cultures. And it is the display of that unity that brings glory to God and men to salvation. Word about the Rural Church Bible Teaching has spread like wildfire! Churches from all over the region are begging for the teaching. We have now gotten additional CDs for those churches in Soyama Town that have access to electricity and can therefore run their own CD players. And when our next Team goes (in November, 2011), we will take additional Saber players. 2 Cor. 15:58: "So, my dear brothers and sisters, be strong and immovable. Always work enthusiastically for the Lord, for you know that nothing you do for the Lord is ever useless." Gal. 6:7: "Do not be deceived. God is not mocked. Whatever a man sows, that is what he will reap." Let us continue to work. The night is coming when no one can work. People are dying every day, passing into eternity without the Life of the Savior. Let us press on!